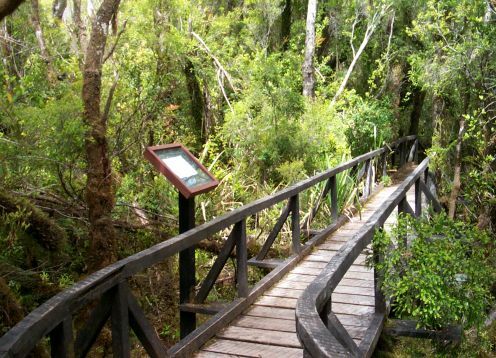 Chiloé National Park covers an area of 43,057 hectares, divided into three lots. The first corresponds to Chepu sector, with 7,800 ha, the second Anay sector and covers an area of 35,207 ha. and the third comprises the island of 50 ha Metalqui. It is located in two sectors of the Coast Range on the Big Island of Chiloe, Ancud commune. Anay sector is located in the municipalities of Castro, Conchi and Dalcahue province mentioned above. For the Route 5 from the city of fort south to the intersection Notuco, is 24 km. of asphalt road. From there it follows a gravel road leading to the community of Cucao on a stretch of 34.5 km. From Ancud along Route 5 south, to the river crossing Chepu, stretch of 25 km. of paved road. The route continues along a gravel road to Puerto Anguay, distane 14 km. From Puerto Anguay requires a boat trip downstream along the river Chepu and then continue walking along a path, mainly coastal, 14 km. length to reach the river Lar, where is located the rangers house in the sector. The total journey takes 5 hours. Restricted Area: You must request permission in offices CONAF Chiloé Province (Gamboa 424, Castro. F :65-532501). The administration of the park area is located in the Chanquínb sector, about 1,000 m. the town of Cucao. From the Park to the administrative headquarters is about 200 m. away.